James Hoyt Wilhelm (July 26, 1922 – August 23, 2002), nicknamed "Old Sarge", was an American Major League Baseball pitcher. Wilhelm played with the New York Giants, St. Louis Cardinals, Cleveland Indians, Baltimore Orioles, Chicago White Sox, California Angels, Atlanta Braves, Chicago Cubs, and Los Angeles Dodgers. He played between 1952 and 1972. He was the first relief pitcher in the Baseball Hall of Fame. Wilhelm did not enter the major leagues until his late twenties. He fought in World War II before playing Major League Baseball. He was known to throw a knuckleball. He sometimes played as a starting pitcher but most of the time played as a relief pitcher. Wilhem won 124 games which is more than any other relief pitcher. He was also the first pitcher to reach 200 saves and play in 1,000 games. He pitched until he was almost 50 years old. Wilhelm retired with one of the lowest career earned run averages in baseball history. Wilhelm coached the New York Yankees and Atlanta Braves many years after his retirement. He was a resident of Sarasota, Florida for a long time and died in a nursing home of heart failure in 2002. Wilhem was born on July 26, 1922, in Huntersville, North Carolina. His parents, John and Ethel (née Stanley) Wilhelm, were tenant farmers and had eleven children. He played baseball at Cornelius High School in Cornelius, North Carolina. There he started trying to throw the knuckleball. Because he could not throw very fast, he thought that being able to throw a knuckleball would make him successful. He used a tennis ball to practice. Wilhem started playing Minor League Baseball in 1942. He served in the United States Army during World War II. Wilhem fought in the Battle of the Bulge and was wounded. He also earned the Purple Heart award. In the military, Wilhem reached the rank of staff sergeant. He was nicknamed "Old Sarge" because he served in the military. After serving in the military, he returned to playing minor league baseball in 1946. 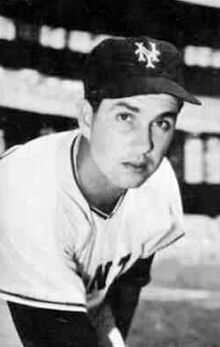 The New York Giants drafted Wilhem in the 1947 minor league draft. This is when he started playing in the major leagues. ↑ 1.0 1.1 1.2 Lueck, Thomas (August 25, 2002). "Hoyt Wilhelm, first reliever in the Hall of Fame, dies". New York Times. Retrieved November 11, 2010. ↑ Armour, Mark. "Hoyt Wilhelm". Society for American Baseball Research. Retrieved January 28, 2015. ↑ "Remembering a Huntersville legend". The Herald Weekly. July 14, 2011. Retrieved January 16, 2015. ↑ "Hoyt Wilhelm Statistics and History". Baseball-Reference.com. Retrieved November 1, 2011. ↑ "Wilhelm first reliever elected to Hall of Fame". ESPN Classic. ESPN. Associated Press. August 29, 2002. Retrieved November 1, 2011. This page was last changed on 2 April 2018, at 00:40.